Eliezer Sobel, author, artist, musician, and by his own description, a human being, has been caring for his parents for many years. His father Max had been the loving caregiver for his mother, Manya, who is in her 16 th year of Alzheimer’s Disease! Three years ago, Max suffered a traumatic brain injury and now is also in full time care at home. Manya has lost much of her language abilities and when she does speak, it is admittedly “dementia-speak”. Eliezer, in his compassionate and good-humored manner, chats with her in the language that she now uses. They converse regularly in this way. One day a few years ago, El noticed that Manya was flipping through a magazine, looking at the pictures and reciting words out loud. He was astonished at her ability to read! How many of us have had the experience of someone living with Alzheimer’s who cannot find their words, but still able to read street signs, billboards, or as in Manya’s case, captions in a magazine? Being the good son that he is, Eliezer tried to find an adult picture book. He wanted something with beautiful photographs of familiar items and short simple phrases. He searched without success for book that would require no memory of the previous page in order to enjoy. 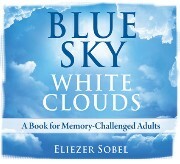 Unable to find anything, El created his first in a series of two books titled Blue Sky White Clouds, A Book For Memory Challenged Adults. The second one, L’Chaim, Pictures to Evoke Memories of Jewish Life, is full of images geared toward people of Jewish heritage living with dementia, hoping to evoke memories, conversation, and tender moments for families. These books are both a visual feast and a simple pleasure -- a must to share with friends and family. You can read more about them and his journey with his beloved parents on his website, http://eliezersobel.com/books.html. One certainly does not need to have cognitive challenges to enjoy these lovely images. We search for activities where we can find connection with a loved one living with dementia - what a pleasure these books are to share and read together!